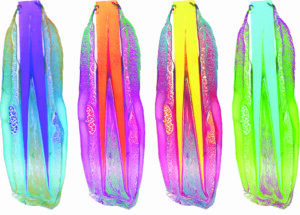 Histological sections of California sea lion whiskers, trichrome stained and then color manipulated in photoshop. 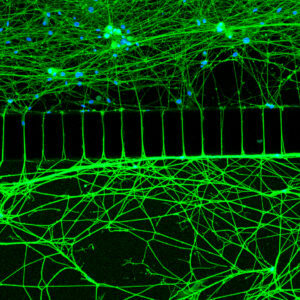 Primary sympathetic neurons cultured in microfluidic devices. Cells are stained with neuronal marker TUJ1 (green) and nuclei are labeled with DAPI (blue). Submitted by: Amrita Pathak, Research Instructor in the lab of Bruce Carter. 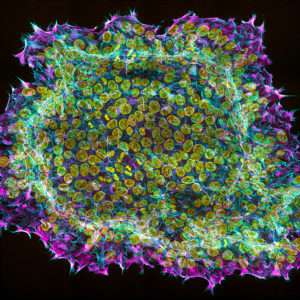 Shown is a colony of human embryonic stem cells showing the actin cytoskeleton (magenta), myosin motors (cyan) and DNA (yellow). Embryonic stem cells, that give rise to all tissues in the body, hold great potential in designing cell-based therapies for multiple diseases. Studying the cytoskeleton of these cells helps us understand how they respond to their mechanical environment and how that affects their ability to both retain their identity or differentiate into specific cell types. Technique used- Confocal microscopy, large image stitching.